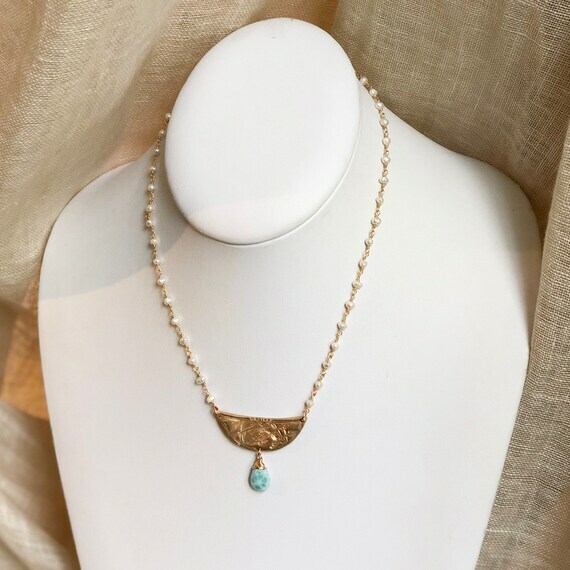 Our original handmade bronze component is suspended from a 22k gold vermeil and pearl rosary chain and adorned with a beautiful pale sea blue larimar gemstone. It is 16" long with a 2" extender. This would be beautiful on the beach...in a bikini or a wedding dress! Larimar is a beautiful pale blue and white gemstone found only in one area of the Caribbean.